I don’t use a set thickness or bracing pattern for dulcimer soundboards. The goal is to create a soundboard with a pleasing balance of weight, stiffness and strength. I have general guidelines for the thickness of various species of wood but the final result depends on the piece of wood at hand. 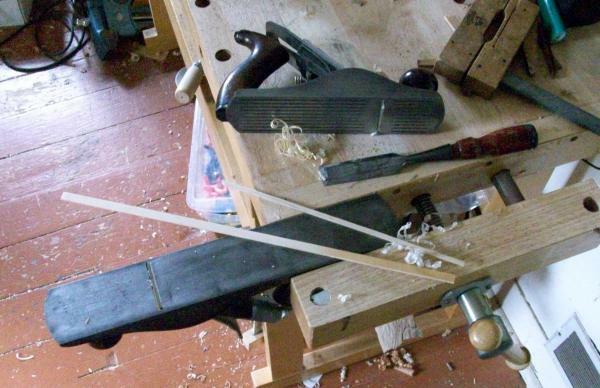 A soundboard that is “just right” for a particular dulcimer may need little or no bracing; graduating the thickness of the soundboard may be all it needs, though I usually add some light braces to add strength and increase stiffness near the sound holes. I prepare the stock by planing it to rough dimension on the inverted jack plane. The chisel is used to chop the brace stock to length and the individual pieces are sized and cleaned up with the smoothing plane. I usually hold the smoothing plane in one hand and run the stock over it with the other. The braces are glued to the soundboard and brought to final thickness and shape with finger planes and chisels.